It is something that, unless you get a hole in one, you have to do on every hole on the course: throwing from a marked lie in the fairway. It is also something that, until you decide to play in a competitive event, is an easy thing to not be concerned with as you play. …the lie is a rectangle that is 20cm wide and 30cm deep, centered on the line of play behind the rear edge of the marker disc. 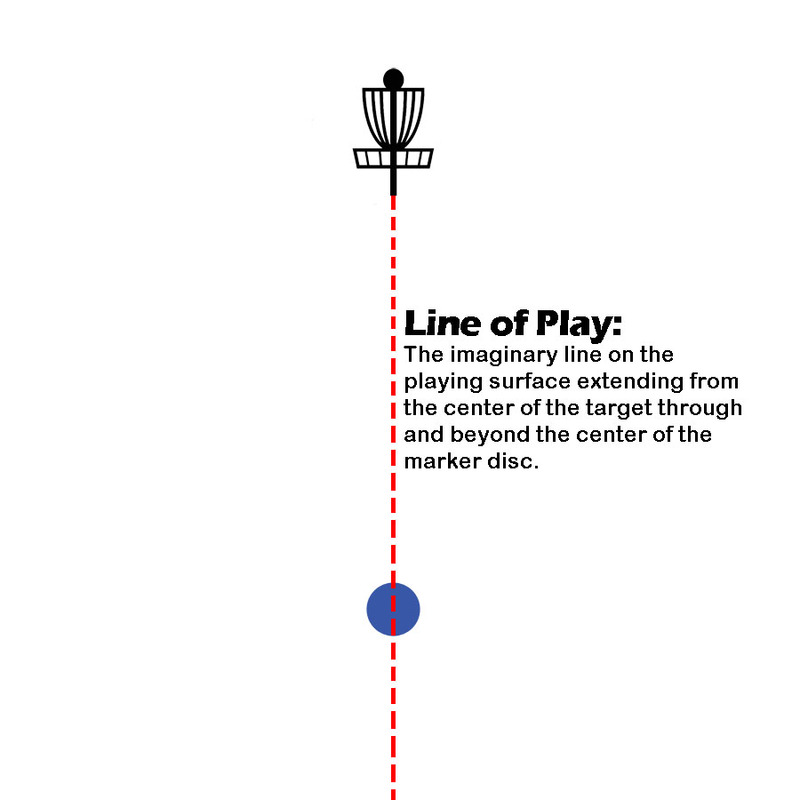 The line of play is the imaginary line on the playing surface extending from the center of the target through and beyond the center of the marker disc. The marker disc, or marker, is the disc used to mark the lie according to 802.06. Line of play is the most important component of defining the lie. If the description within the rule is not enough, here is a graphic demonstration of the line of play. Definitions now in mind, we can jump into the primary rule at hand, 802.07 Stance. This is the heart of taking a stance in the fairway. 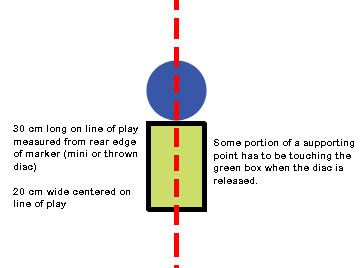 Part one is having at least one supporting point in contact within the 20×30 cm box centered on the line of play directly behind the disc. That point can be a foot, knee, hand, elbow, even one’s head if so inclined. Part two has more to do with the supporting points outside the one on the lie (though that point can not be contacting or extending in front of the rear edge of the disc). Those points can be anywhere on the playing surface except somewhere closer to the target than the rear edge of the marker. Bear in mind that the border of what is closer and what is not is defined by an arc (see below). As long as everything is behind that arc at the moment of release, it is in a legal position. It is important than when taking a stance anywhere on the fairway, it must be taken as is. This includes working around any obstacles that may be in the way of the stance. 803.01 A. A player must choose the stance that results in the least movement of any obstacle that is a permanent or integral part of the course. Once a stance has been taken, the player may not move an obstacle in order to make room for a throwing motion. It is legal for a player’s throwing motion to cause incidental movement of an obstacle. For example, if one’s lie is under a tree or bush, then the stance taken must result in the least possible movement of the tree or bush. If that means one has to lay down on the ground to avoid bending, breaking or otherwise moving branches to take a stance, then that is what must be done. The rules entitle a player only to a legal stance, not necessarily a comfortable or preferable one. A. Any throw made from within 10 meters of the target, as measured from the rear of the marker disc to the base of the target, is a putt. B. After having released a putt, the player must demonstrate full control of balance behind the marker disc before advancing toward the target. A player who fails to do so has committed a stance violation and receives one penalty throw. Here is the trickiest part of any stance away from the tee. When the lie is within 10 meters (approximately 32.8 feet), following through after the throw is against the rules. 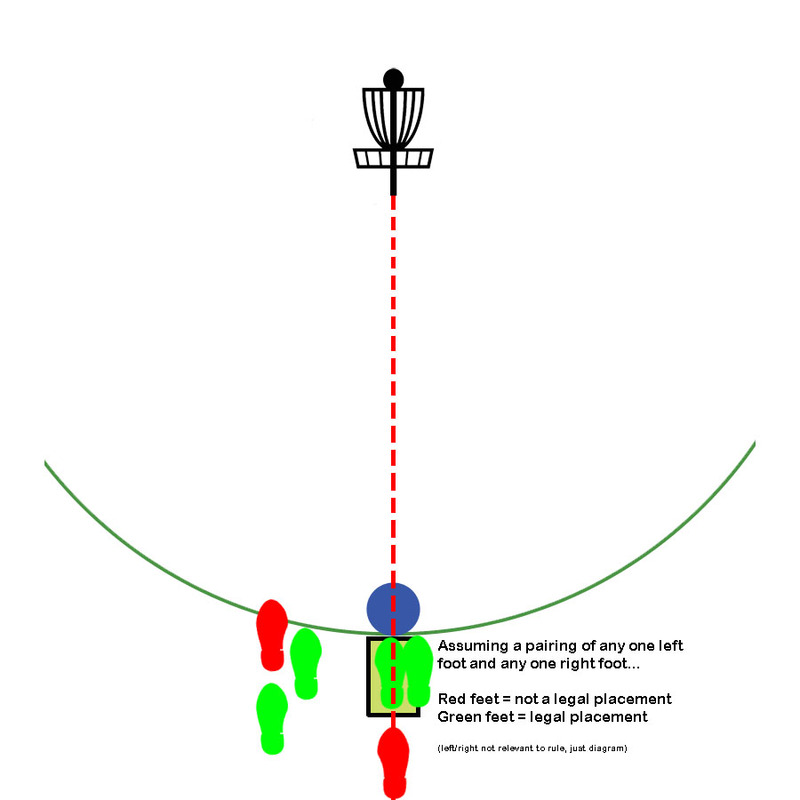 To avoid the follow through, the player must demonstrate balance before making contact with anything closer to the target than the rear edge of the disc. Visualizing the above diagram is a great way to remember these stance rules whether in the fairway or putting. At the time of release, no supporting points should be in contact in the blue area. And when putting, no supporting points should be in contact in the blue area after release until full control of balance has been established. 802.07 C. A player who violates 802.07.A or 802.07.B has committed a stance violation and receives one penalty throw. Any player in the group may call another on a stance violation when one occurs, and that includes calling it on oneself. The call must be made promptly, typically before the result of the throw is known. As is the case with any violation that comes with a penalty, two or more players must agree that the violation occurred. See rule 801.02.E. A call made by a player for a rules violation that results in one or more penalty throws can only be enforced if the call is confirmed by another player in the group or by a Tournament Official. A penalty throw is a throw added to a player’s score for violating a rule, or for relocation of the lie as called for by a rule. So in the case of a stance violation being called, it requires at least one other player to “second” the call in order for it to stand and a penalty to be applied. The thrower plays on from the result of his/her throw after the call is made, adding one throw to their score for the hole. That’s it. A rather simple part of the game that is at the heart of fair competitive play. The spirit of the game is to play the disc as it lies, and through these rules, we ensure exactly what “as it lies” means. With a bit of practice, complying with it becomes almost second nature.